Glowing lustrous skin and strong, bouncy hair is not a mere sign of beauty but reflects your good health as well. This lit from within beauty can be achieved with Ayurveda. Ayurveda is synonymous with happy skin and hair. It not only addresses the superficial appearance-related concerns but treats any kind of disorder from its origin. It is important to follow a specific Ayurvedic regimen consistently to witness a happy body, skin, and hair. Every body type is different and concerns are also different. Ayurveda states that everybody has different kinds of ‘doshas’. There are three types of doshas- Vata, Pitta, and Kapha. According to the doshas, one can treat various concerns be it skin problems like acne or hair problems like baldness or greying hair. For example, for clean skin application of skin clearing ingredients alone won’t be useful. They may help in clearing the skin temporarily but for long term results, it is important to have herbal concoctions that detox your body of the toxins that are triggering the skin problem. A clean diet supplemented by herbs along with a natural skin care regimen can help you to achieve the happy skin you have been looking for. A simple example of an Ayurvedic regime can be the consumption of lemon water first thing in the morning. It detoxes your body, works on metabolism and gives you a natural glow. The use of natural cleansers like gram flour with a pinch of turmeric is the perfect way to kickstart an all natural Ayurvedic regimen. Switch your shampoo with natural reetha and amla concoction. If making this at home is too much effort for you, there are organic brands which offer home-made skin and hair solutions with zero preservatives. Try following a specific regimen as per your skin type for at least 15 days to see the results. Your hair and skin will definitely thank you! Ayurveda aims to help you strike the right balance between your mental and physical well being which reflects on your appearance. A person who is overall relaxed and has a clean mind and body will obviously have glowing skin and hair. That’s the approach of Ayurveda. 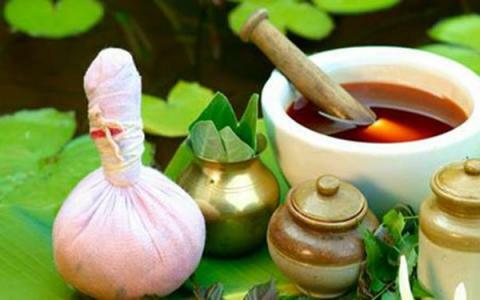 Ayurvedic therapies help you address your skin and hair concerns in a very soothing yet effective manner- the natural aroma of fresh ingredients provides you with natural aromatherapy that calms your mind while the active compounds in these ingredients act effectively on the disorders that you intend to correct or cure. It is important to do proper research and test the ingredients you want to incorporate in your journey to happy skin and hair to avoid any kind of side effects.